A number of Ancient writers (Herodotus, Strabo, Pliny etc.) make reference to an ancient civilization at the western extreme of the Mediterranean known as Tartessos, Herodotus tells the legend of a Greek Sailor called Koliaos who blew off course and arrived in Tartessos to find a kingdom rich in silver and other metals. After being royally entertained for some months, his ship was loaded up with silver and he was sent home. Whilst there is little firm evidence of any formal kingdom of Tartessos, we do know that Iberia was a major source of silver for the Iron Age Near East. For this reason, Phoenician traders and colonists arrived in droves to ship back silver to the Assyrian Empire. The Phoenicians began to arrive around 1,000-900 BC, their first major colony was Gades (modern Cadiz). Centuries later, the Greeks arrived and set up their main colony at Emporiae (modern Ampurias) in 575 BC. 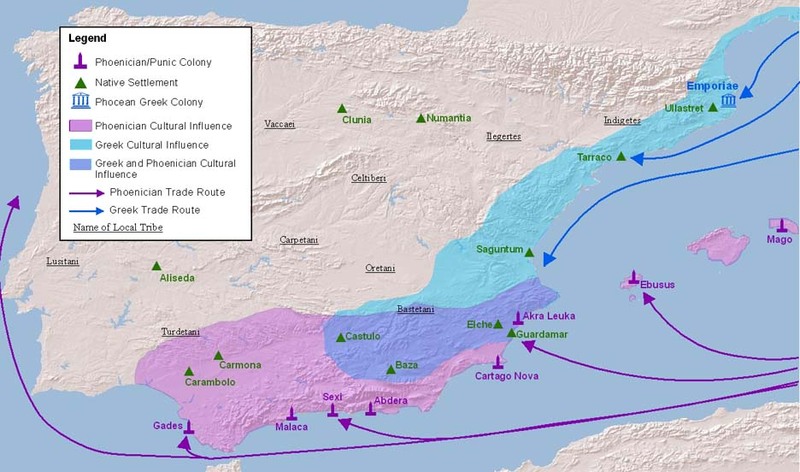 A similar process of cultural diffusion took place in Iberia as in Sicily, the local Iberians began to adopt Greek and Phoenician artistic styles, most evident of this are a set of famous sculptures from South East Spain such as the Dama de Elche.